Fashion Lightroom presets, Adobe Photoshop actions and Camera RAW presets collection is professionally designed to give your images a magic and remarkable tone, enabling you to streamline your editing process and enhance your images. A MUST HAVE for beauty, glamour and fashion photographers, and fashion bloggers. Fashion photographers are always looking to push past the boundaries of contemporary and normal photography. From creating beautiful photos that showcase models, clothing, and accessories to producing photos that push the limits of the imagination, professional fashion photographers rely on their raw talent to deliver beautiful photography. If you’re a fashion photographer, then you know how important it is to be able to create photos that are professional, artistic, and edgy. You have the keen eye to bring the photo from imagination to reality, but photo editing and post processing could still be challenging and very time consuming. Not only can this keep you from your next assignment, but it could limit you in your ability to create the photo you see in your imagination. However, with Fashion Lightroom Presets, Photoshop Actions and ACR Presets collection, you can deliver those glamour shots that you know you have the ability to do. Trying to capture that beauty or glamour shot can be incredibly difficult, which is why fashion photographers take the time to plan their shots from poses to lighting to backdrop. Everything must be perfect, but presets can help make that process easier and cut down on any post processing. 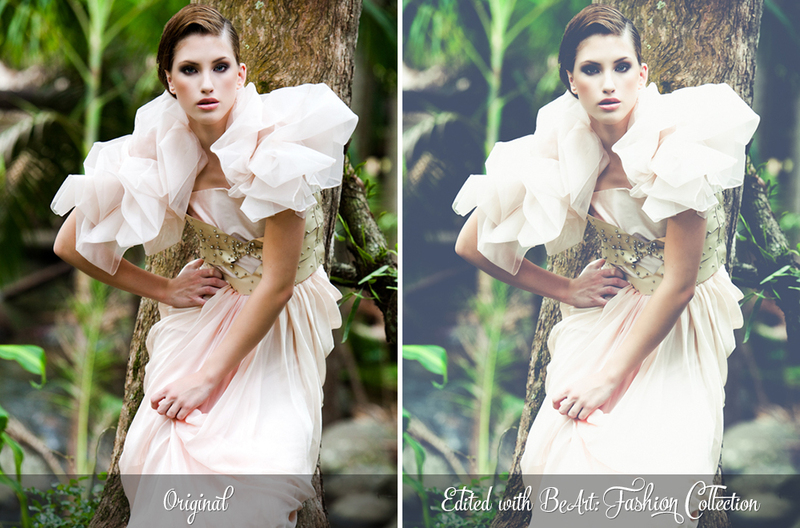 Fashion Lightroom Presets and Adobe Photoshop Actions help you simplify your editing process while still giving your photos the enhancement and thrill that fashion photography requires. Furthermore, it helps you create the aura and feel of an ominous dream that many fashion bloggers aim for in making edgy photography. This type of photography is most often done in creating a photo in black and white. It’s a popular way of doing fashion photography, but it’s difficult to do without the right conditions, such as good lighting and rich colors. Without these conditions, fashion photography can look flat and lifeless. However, with presets that help make colors richer and lighting perfect, your photos will have the dreamlike quality you desire. 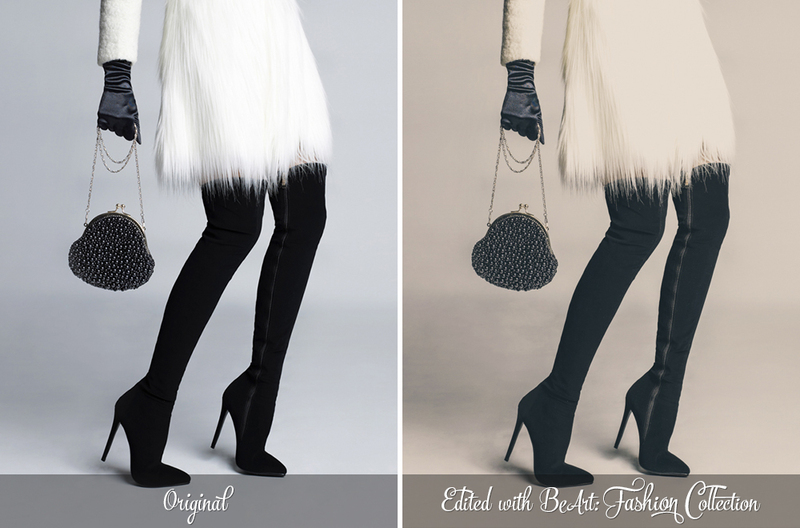 Fashion Photoshop Actions and photography retouching will get your photos ready for publication in both black and white and color format, whether in a fashion photography magazine or your own fashion blog. Fashion photography is edgy, ominous, and pushes the limits of our imagination. It lets us peak into another world that is dark and unknown, terrific and yet exciting. Presets will help you create the window into that world, captivating viewers and fashion fans with beautiful and life-breathing photography. It can be a time-consuming and painstaking process, but with the help of Lightroom Presets and Photoshop Actions, you can cut down on time and frustrations. Raw talent can only get you so far with glamour fashion shots. It’s difficult to control weather, lighting, and even the model. Creating high-quality fashion photography is difficult enough without unaccounted for shadows, lighting discrepancies, or incompatible makeup. However, with the help of 40 Lightroom Presets, 40 Photoshop Actions, and 40 Adobe Camera Raw Presets, you can make your job easier and enhance your talent for creating edgy, glamorous photo shots. 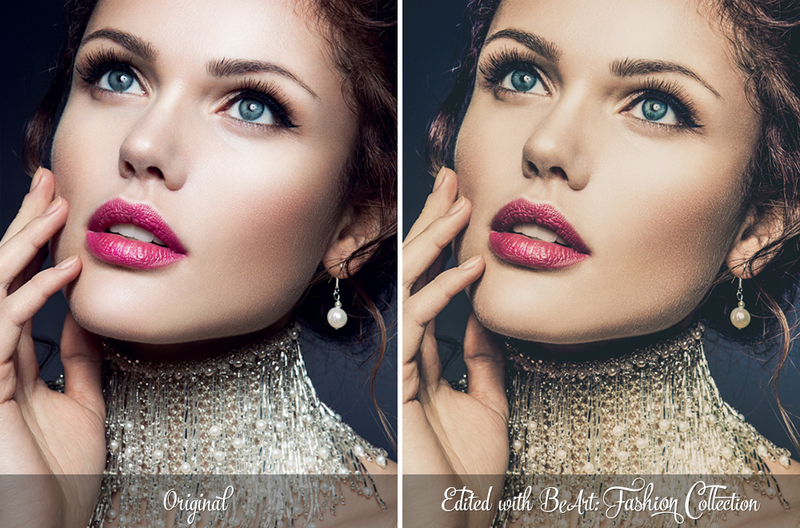 Don’t waste time or talent on the post photography process when you can easily make beautiful fashion photos with simple retouching through the Fashion Collection for Lightroom and Photoshop. Streamline your editing process and improve the quality of your portraits and fashion photos with BeArt Presets and Actions for Lightroom and Photoshop. After you download the plugins, you can start installing and using them on the spot.